Shared, Managed WordPress Hosting, Reseller, Cloud, VPS, Dedicated, Colocation and Self hosting explained. Each type has a different purpose. Shared hosting is the cheapest and most basic and is suitable for a website with a small number of visitors. A dedicated server a lot more expensive but is suitable for a website with a lot of visitors. You could start with the cheapest reliable service and upgrade as your site gets more visitors or you could anticipate a number of visitors that you will get in the next year or so and start with a hosting provider to meet your future needs. This could save you the time and cost of moving your site to new hosting. Cheaper price: $5 – $20/month. You website visitors may experience slow loading speed if other sites you share the server with also have a lot of visitors or there are too many website on the shared server. Website hacking issues (hackers may access your shared server via other websites even if your site is secure). Shared hosting means that your website is located on a shared server with lots of other websites. The advantage of this setup is the shared cost. The monthly cost is lower when you are sharing a super server with of other websites. The biggest disadvantage of shared hosting account is that you share the server resources with the other sites hosted with yours. If the hosting company has allowed too many websites to be hosted on the server with your site or if some of the sites on your server get a lot of visitors then your site will become slow or may be inaccessible. Shared hosting is a good option for small bricks and mortar business that just want a simple website that has basic business information like an overview of their products and or service and contact details (address, phone number & email). most are based on shared servers so the performance of your site may be impacted on by other sites on the same server. With the increasing popularity of WordPress as a web building platform, many web hosting servers are offering what’s referred to as “Managed WordPress Hosting”. WordPress hosting is only for websites that run wordpress. WordPress is an online, open source website creation tool that is highly customizable. WordPress is the easiest and most powerful website content management system (or CMS) available. Managed WordPress hosting is where the web host provides an additional service of managing your wordpress application. The provider will make updates to the core WordPress installation and may also update the wordpress theme (the theme generates the layout and style of your website) and/or plugins (plugins add extra functionality to your site). Managed wordpress hosting providers may also limit the types of themes or plugins allowed (for security reasons) and/or provide other security measures. Managed WordPress hosting providers set-up their infrastructure to be optimized for WordPress to be fast and stable. WordPress the most popular website content management system mainly because it is easy to setup and use. WordPress is also highly flexible with the ability to customize and extend its functionality. However, unless you are tech savvy setting up and managing even a wordpress website can be challenging. WordPress required regular updates and if you have extended functionality (through plugins) your site can break and requires technical knowledge to fix. If you are a business owner then learning to set up and manage a website it probably the last thing you want to do. If you are a bricks and mortar business that need a minimal web presence then managed wordpress hosting may be the easiest option for you. Flexibility & scalability, cloud hosting can expand and contract with your immediate needs. This is great for if your business rapidly expands and you need to keep up with an increasing number of visitors. Quick to start up. Because of the way cloud servers are run, there is a quick set-up process compared to other hosting types. Cost effective because cloud hosting can scale up and down as you need the cost will be proportional to the required size. You can overestimate your needs and order a plan that is too expensive. You pay extra to have the flexibility of cloud hosting. If you know that you are unlikely to get a spike in visitors then cloud hosting may be overkill for a small brick and mortar business. Cloud Based Web Hosting is a type of web hosting that has multiple servers that work together like one giant server. This means that as your website grows and you are getting more visitors, the cloud hosting can add more hardware resources to running your site to keep up with demand. With cloud-based web hosting, if you get a spike in website visitors, the cloud hosting can manage it and your website will not crash (and be inaccessible to visitors). Based on shared hosting so performance issues are likely. A reseller hosting package is usually shared hosting account with an additional option so that you can resell hosting space to other people. Reseller web hosting plans have greater control (often via the Web Host Manager (WHM) control panel), billing software for invoicing clients and other features. High cost. A VPS is significantly more expensive than shared web hosting. Advanced technical knowledge is required to maintain the VPS so you may need to hire a VPS system/server/network administrator. A group of virtual private servers will share one physical server, however, because each VPS is a partition that acts like multiple, separate servers each with its own separate amount of resources (RAM, CPU power & storage space). A VPS is an intermediate option between shared hosting and dedicated hosting. Because a VPS has its own exclusive computing resources (CPU power, RAM and storage) it is insulated from what other website on the server are doing. This is unlike shared hosting where other websites on a shared host can use up resources and take resources away from your site (making it slow or do down/crash). Performance and Reliability (unlimited bandwidth and disk space). Powerful enough to cope with tens of thousands of website visitors every day. Full control. It is your server and you can do whatever you want with it. You will need to setup name servers. A dedicated web server provides a high performance at a high cost. To set-up and manage your own server (dedicated server) requires a lot of technical skill. You could hire a technician to do this for you also at a cost. A dedicated web server is suitable if your website has a lot of visitors or has to process a lot of financial transactions. A dedicated server is generally overkill for a brick and mortar business or a new business that is not likely to have many visitors. Colocation web hosting is where you supply your own server machine and rent rack space, the I.P. address, power, cooling, physical security and share their bandwidth as your own from a data center. After you setup your machine, you physically take it to the data center of the colocation web hosting provider and install it in their rack. Alternatively, you can rent a server machine from the colocation provider. 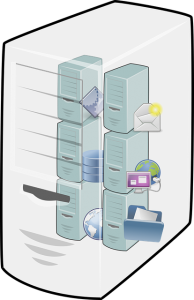 You are responsible for all of the server software, data storage, backup procedures, etc of your server machine. If anything goes wrong (software or hardware problems, you need to fix or replace it. Unless you have the technical know-how in-house, colocation is probably not worth the investment in time, expertise, and money for most small businesses. Colocation is a hosting option for small businesses that want the features of a large web presence without the large costs. Self Service Web Hosting is the DIY of web hosting. You do everything from buying setting up all of the hardware, software, power, internet connection, cooling, redundancies, and backups. Unless you have a serious need, chances are this option is not worth it for a small to medium sized business. Now that you understand all about hosting types find out more information about building a website.